Popular author and teacher Joyce Meyer has said some shocking things in some of her sermons and teachings. Many of those who listen to her have never heard her make any of the claims that I'm about to show you. These are clips that I have put together and uploaded to YouTube to show that I hope would cause any discerning Christian to have second thoughts about listening to Joyce Meyer. Folks, these teachings come straight out of the cults, and are extremely dangerous. All of these teachings can be found in the Word of Faith Movement. Nowhere do the Scriptures ever even imply this. If this were true Christ's words at the cross meant nothing. John 19:30 When Jesus had received the sour wine, he said, "It is finished," and he bowed his head and gave up his spirit. The Spirit wrote the Word. He would never say anything that contradicts the Word He wrote. Many of Joyce Meyer’s teachings contradict the Bible. Besides, the way God speaks to us today is not through direct revelation but through His Word. Red flags should start flying every time you hear someone say "God spoke to me." This was also taught by the Father of the Word of Faith Movement, Kenneth (Dad) Hagin. Again, another teaching that contradicts Scripture. Jesus called God His Father while He was still on the cross. Luke 23:46 Then Jesus, calling out with a loud voice, said, "Father, into your hands I commit my spirit!" And having said this he breathed his last. Luke 11:13 If you then, who are evil, know how to give good gifts to your children, how much more will the heavenly Father give the Holy Spirit to those who ask him!" 1 John 1:10 If we say we have not sinned, we make him a liar, and his word is not in us. Word of Faith teachers say that God created man as a little god. Kenneth Copeland for example teaches that Adam "was God manifested in the flesh." However, Adam lost his godhood when he disobeyed God and ate of the tree that God commanded him not to eat f rom. Through this sinful act, Satan became the god of this world and Adam lost his godhood. But thankfully God was able to thwart Satans plan and sent Christ to buy back our godhood through His death on the cross, and suffering in hell. Now through faith in Christ, Christians are given back their god status and by growing in faith (becoming more and more aware of who we are as little gods) use the "force of faith" to get all that we desire from this life. Of course the Bible teaches nothing of the sort. There is only one God, and we are to worship Him alone. Adam was created a man and not a little god. Nowhere in Scripture will you see anything that even implies this. Satan told Eve that by eating the fruit she would become "like God, knowing good and evil." No! We were never created as "little gods." This teaching is blasphemous and to embrace it will ultimately damn your soul. "Why did He need to be begotten or born? Because He became like we were, separated from God. Because He tasted death for every man, His spirit, His inner man, went to hell in our place." No! Christ became human at His incarnation. The Eternal Son of God, Second Person of the Trinity is the God Man, our New Adam, keeping the Law for us and dying in our place to pay the penalty for our Law breaking. He was not born again. He never needed to be born again. If He did then how could He be a perfect sacrifice for His people. God required a perfect sacrifice to pay for sins. If Christ had to be born again, then He was not that perfect sacrifice. My prayer is that you will listen to these clips, compare them to Scripture, and then warn your family and friends who may be caught up in the teachings of Joyce Meyer. Ok...Find me one teacher who never says one word wrong. There is not one perfect pastor. let him who is without sin cast the first stone. How sad you didn't research the subjects she was preaching. You're obviously not spirit filled or you would have received direct revelation about what she wants to convey. Honestly, just reading and googling bible scriptures is not going to give you the wisdom and discernment this woman has. Blog what you know, you'll seem less ignorant. Wisdom and discernment may be foreign to you, but that's the path this woman walks. You're obviously NOT spirit filled or spirit led. And I seriously doubt you had any direct revelation before posting this disrespectful piece. Sincerely research within your capacity. Her preaching may be beyond your comprehension. Blog what you know that you know that you know, please. these false teachers --like...:joyce Meyers.......joel osteen.....both .Copelands...t. d. .jakes...creflo dollar...jesse duplantis.....etc.....are perhaps God's judgement upon those who follow them....they all have the love of the world in them........the " word of faith" movement is new age philosophy in Christian-like disguise......if you are lost in it....get out...find solid biblical teaching.........BEWARE.....YOU HAVE BEEN WARNED...!!!!!. If we study the Bible, God's Word, we can see the where the teachings are wrong. I believe this is the problem; people don't study, much less read the Bible. It's not a matter of being a "perfect teacher." It is about teaching things which blatantly go against Scripture. Test her doctrine against God's Word. Test everything against the scriptures. Here is the bottom line: Joyce Meyer is a false teacher. Period! This is not about saying something wrong sometimes, it is about a pattern and career of false teachings. Lorre, this is not about being a "perfect teacher." It's about misconstruing God's Word for profit and gain. This is what Meyers has been doing for decades, and she is feeding off of people such as yourself. If you studied your Bible all the time, like you claim, then why can you not see how she constantly takes Scripture out of its original context and applies it the way she wants to apply it? There is such a thing as hermeneutics, you know? We can't just "make up" an application of a particular verse. It must be kept in its original context and historical setting. Heir2theThrone, what makes you think we haven't researched this stuff? Do you really believe just post something without understanding what is being taught? Sorry. But we don't do drive-by-postings. Danny spend hours listening to her sermons, reading her material, and watching interviews with her, as well as other wolves, getting the context and teaching straight from her own mouth! If you claim to be full of discernment and wisdom, yet do not see the dangers in her teaching and how it goes against Scripture then I'm afraid Satan has deceived you and blinded your eyes. If so-called professing Christians would take the time to read and study Scripture in its original context and actually study rather than a perused reading, we would readily more condemn these type of teachings. May God grant you all peace and an understanding of His Word in Truth. Thank you. #1 Jesus 'descended' into the 'lower part of the earth'; this is not 'hell',,,but, 'sheol/hades'. There is a great difference! #2. The Holy Spirit gives us 'revelation' daily from the Word of God. But, it is NOT 'inspired' in such a way, as to add to Scripture! #3 #4 and #5 are nothing but, 'doctrinal dung'! The Word of Faith Movement with it's 'seed faith' false doctrine can be likened to a 'malignant, cancerous tumor' that has spread through much of the 'cultural church of today'! Like u r without Sin!! U need to wake up from your woman hating crap!! The Bible says in Acts 2:19 I will pour out my Spirit on all daughters and they shall Prophesy. What do you think Joyce is doing Prophesying the Gospel. God speaks to us in different ways. He says it. He shows it in many places. And in one place He says old men will dream dreams and young men will see visions. The roots of the sycamore being bronzed, was that not a sign? When the sycamore fell (type of fig tree) and it protected the church, was God not speaking to all of us? How many people were visited by The Angel of The Lord? Looking at the capitalizations when He is mentioned, who do you think that was? In Psalms 82:6 The Bible says we are all gods and we are sons of the Most High. In John 10:34 Jesus says, "is it not written in your Law, I said ye are all gods"? There are other places where the author of this blog is wrong, but no need to point them out. The point is he is telling you she doesn't know scripture, yet he doesn't know scripture. He says not to listen to her because of it, so do you really think you should listen to him based on the same reasoning he uses? It seems she may know the scripture better than him. And being flawed, I would listen to a person who admits she is flawed before I would listen to a person who bashes a person for it, like he (himself) is not flawed. 1. She's a woman. 2. She's a woman. 3. She's a woman. 4. She's a woman. 5. She's a woman. and 6. She's a WOMAN!!!! For crying out loud, doesn't anybody else see this!!!! There's a WOMAN preaching!!!! This is an outrage!!!! Psalm 82 God has taken his place in the divine council; in the midst of the gods he holds judgment: “How long will you judge unjustly and show partiality to the wicked? Selah Give justice to the weak and the fatherless; maintain the right of the afflicted and the destitute. Rescue the weak and the needy; deliver them from the hand of the wicked.” They have neither knowledge nor understanding, they walk about in darkness; all the foundations of the earth are shaken. I said, “You are gods, sons of the Most High, all of you; nevertheless, like men you shall die, and fall like any prince.” Arise, O God, judge the earth; for you shall inherit all the nations! 2John 7-10 Everyone who goes on ahead and does not abide in the teaching of Christ, does not have God. Whoever abides in the teaching has both the Father and the Son. If anyone comes to you and does not bring this teaching, do not receive him into your house or give him any greeting, for whoever greets him takes part in his wicked works. Are you defending her because she is a woman? There's more important work to be done than slamming other Christian like you are. Quit looking for negative in others. Move on. We all have differences yet love our Father. Your reply is totally wrong on many counts. mcguirefolks, sure, let's NOT worry about false teaching that damns people to Hell. I don't think so. mercyminister, I would be honored if you would show me the many wrongs of my reply. This, actually, is yet another example of something taken out of context to smear another person's credibility. Joyce does in fact teach right out of the scriptures and gospel and I have yet to find anything she teaches to go against Biblical teaching. I have to disagree wholeheartedly. 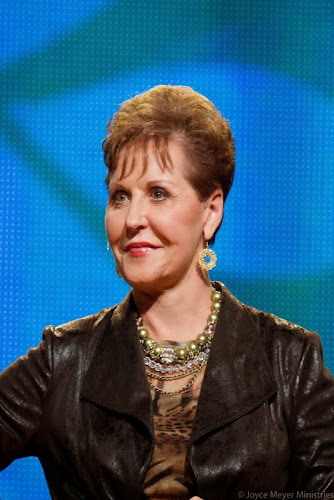 This is an invalid article as this is not Joyce Meyer speaking in these clips. "For the time will come when they will not endure sound doctrine; but after their own lusts shall they heap to themselves teachers, having itching ears" 2 Timothy 4:3. Joyce is a millionaire false teacher who is sending millions to hell with her. People who defend her are followers of men and not of Jesus Christ and they are more passionate about defending their heresies than about God's word. Sad times. There is no excuse for putting your own mistake on God's word. It's already written perfectly in the book. It's either the Holy Spirit helps you develop it or some other spirit gives you the translation. It's either The Spirit of the truth or the spirit of lies. This is one reason I hate all you Christians. So judgemental. I have heard several MALE preachers speak on these various points before. It's nothing out of left field its a matter of interpretation which is what religion is. Christians are some of the worst type of people I have met in my life. Stephen Carcello, copying and pasting scripture over and over without understanding the context does not serve your arguement well. Your ignorance is amusing though. by looking at these comments and judgmental statements of one another i don't blame the person above for commenting that she/he for hating all christian in general. so she/he is right about various points and interpretation and the so called religion attitudes that puffs up the pride...so im calling on the disciples "you, yes you" to take a good look at your heart and see that even satin can deceived you all in which he has. love the lord god with all of your heart,soul,mind,strength,and love your neighbor as yourself. There is a difference between fruit inspection and judging. 12 “Behold, I am coming quickly, and My reward is with Me, to render to every man according to what he has done. 13 I am the Alpha and the Omega, the first and the last, the beginning and the end.”14 Blessed are those who wash their robes, so that they may have the right to the tree of life, and may enter by the gates into the city. 15 Outside are the dogs and the sorcerers and the immoral persons and the murderers and the idolaters, and everyone who loves and practices lying. She is just as bad as Joel & Victoria Osteen, Benny Hinn, Creflo Dollar and others who are leading people astray, which will ultimately lead them to hell if no one tells them the truths of God's Word. Do not touch my chosen people, and do not hurt my prophets." I agree. I don't think these pastors that are mentioned in above statements are a threat to the church. I have heard pastors of other denominations take scripture out of context. I think the biggest threat to our church is deacons, Sunday school teachers...anyone in church laity...who goes to work and throws fits, cusses like it's a second language, gossips, backbites, stirs up trouble, busybodies....and the list goes on and on. These sins are the biggest threat to the church because they cause dissention and excessive hurt. The break down of the family in the church is much bigger than any of these TV preachers. These issues are more urgent and in need of solutions than panicking over what is said on certain platforms. NONE of us have the perfect interpretations to every scripture. I have heard so many awesome preachers of respectable faiths, but I do not agree with everything they teach...does that make them non-legit? No, I could have it all wrong or so could they. Rabbis debate scripture daily...they say this, "You can have 3 rabbis in a room discussing scripture and you will have 3 different interpretations." If I don't like a speaker, I simply won't listen, but I will not ruin it for the person who is getting something out of what truths the TV preacher IS speaking. Amen, many who think they will enter heaven will themselves be judged for judgments of being so called religious in their mind but not in Holy Spirit . Acts 2:19 is in reference to a prophecy for Isreal by the prophet joel concerning the coming Messiah and the first century church which is ultimately fulfilled at Pentecost, this is confirmed by Peter in his sermon. Context context context. I can't see anything joyce Myers says that would lead a person to hell,even her opinion. What am I missing? Joyce preaches a false gospel; a gospel that propagates becoming rich in Jesus' Name. She has taught in her books that one can "pray" the blood of Jesus over their material possessions and save them. She teaches that she is not a sinner, which is in clear violation of Scripture (cf, 1John 1:7-9). It is not just a matter of her opinion. It is a matter that Scripture takes seriously. Jesus warned against it, as well as all the other apostles. Even though she may speak some truth, she still mixes it with lies, and that is what makes her a damnable false prophet. Please read the blog rules in the 'About' section before posting your comment. Otherwise, your comment may be deleted without notification. Thanks.